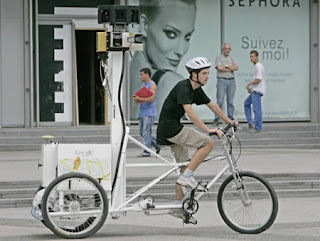 Google (GOOG) has hired two lucky young men to ride around France on dopey looking tricycles snapping up photos of historical sites that are inaccessible by car. This three-wheeler is a sight with its long pole holding nine cameras, a GPS, a computer and a generator. But the contraption tooling around the French capital needs all that gear to do its job – adding three-dimensional images to Google's Street View Maps. The riders, wearing Google tee-shirts and white helmets, are visiting well-known sites such as the Chateau de Versailles, west of Paris, the Jardin du Luxembourg on the city's Left Bank or Les Halles, in the busy centre of the French capital. Google offers a free, online "Safe browsing diagnostic" page that you simply change the web address to the website you want to check for safe browsing. Google Earth Will Track Cars and People In Real Time -- cool or scary?